SUBHEAD: A single tweet could land a Japanese nuclear activist in jail and attempt to discredit ex Fukushima mayor depicted in comic strip. 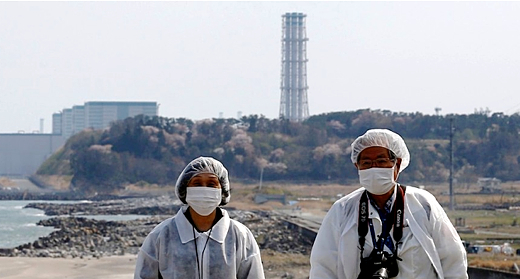 Image above: Two Japanese women in Fukushima Prefecture wearing protective gear near the Fukushima Daini Nuclear Plant just a few miles from Fukushima Daiichi. From original article. In 2012, more than 15,000 people living near the crippled Fukushima nuclear power plant filed a criminal complaint at the Fukushima prosecutors’ office. They alleged that Tokyo Electric Power Company (TEPCO) and the Japanese central government were criminally negligent for the March 2011 Fukushima meltdown and the way in which the resulting cleanup was handled. The Fukushima police, however, declined to investigate. And prosecutors quietly dropped all charges against TEPCO, arguing that it was too difficult to prove criminal negligence even though several third-party watchdogs found that TEPCO and government officials had failed to carry out measures necessary to prevent the disaster despite knowing that a devastating earthquake could potentially strike near the plant. Even an independent investigative commission set up by the Japanese National Diet had concluded, "The meltdown was a manmade disaster." Meanwhile, Fukushima police and prosecutors have set their sites on a 47-year-old single mother named Mari Takenouchi because she wrote a tweet critical of a nuclear lobbyist. Takenouchi may go to jail for it. Fukushima police and prosecutors are currently investigating Takenouchi for criminal contempt; if found guilty, she could face a month in jail. Prosecutors confirmed they will be flying to Okinawa, where Takenouchi lives, to question her on May 13. Police have already traveled from Fukushima to Okinawa to interrogate her — an unusual occurrence. “We only send police officers from one prefecture to another if the subject is really a potentially dangerous criminal,” Fukushima police spokesman Lieutenant Tadashi Terashima told VICE News. The Japanese can't stop eating endangered sea mammals. Read more here. "There's a common point between the 2 criminals of the century. Yasuhiro Nakasone, who introduced nuclear plants in Japan, said: 'I didn't expect Japan in 2011 to become such a battered country.' Ryoko Ando, a (pro-establishment) citizen activist who hosts Ethos' human experiments in Fukushima, said: 'Is this the kind of world we've arrived at over the 67 years since the end of World Ward Two?' Written on Nagasaki Day." Nakasone was an influential Japanese politician for much of the second half of the 20th century — he served as Prime Minister in the 1980s — who championed Japan's exploration of nuclear power in the 1950s. Ando is the Japanese head of Fukushima Ethos, a project led by French NGO the Center of Studies on the Evaluation of Protection in the Nuclear Field (CEPN) and funded by the French nuclear energy lobby. Fukushima Ethos encourages residents to continue living in contaminated areas as long as decontamination procedures and radiation measurements continue to be done. "Human experiments," in Takenouchi's opinion. “Ryoko Ando blocked me on Twitter and rejected my offer to engage in an open debate with a mediator," Takenouchi told VICE News, "and instead filed a criminal accusation against me." After the tweet appeared, Ando reported it to the Fukushima Prefectural Police, accusing Takenouchi of either criminal defamation or criminal contempt. This past January 29, Takenouchi received a telephone call from Fukushima police, notifying her that Ando had filed a complaint against her. Two weeks later, Takenouchi said police came to her apartment in Okinawa and examined her computer. She was also asked to attend an interrogation at the Naha City police station. During the interrogation, Fukushima police asked her about her background as a reporter, her career as an anti-nuclear activist, and why she used the words “human experiment" in the tweet. So far, Takenouchi's legal fees have totaled about $5,000, which she's been paying with the help of donations. “I'm affected by this accusation to the point that I cannot sleep at night, but I would like to keep fighting for protecting our freedom of speech and for protecting the health of the children of Fukushima,” she said. Ando, meanwhile, acknowledged to VICE News that she'd filed the complaint, but despite repeated requests to clarify her position and the position of Fukushima Ethos, she said she would not comment on the investigation until it's concluded. The charge of criminal contempt is very different from a charge of libel in the US. Takaaki Hattori, a Japanese legal expert and co-author of Modern Media and The Law, says the charge is inappropriate. "It's unprecedented for the police to launch a contempt investigation against a journalist for a single tweet, made in the public interest," he said. "If all debates about nuclear energy in this country are going to become grounds for criminal investigations, freedom of speech will vanish. The fact that police even sent the case to the prosecution is disturbing." Still, this isn’t the first time those with ties to the nuclear industry have used the law in an attempt to silence criticism in Japan. In 2012, the president of nuclear power safety company New Tech brought a $600,000 lawsuit against investigative journalist Minoru Tanaka, who exposed links between the Japanese mafia, politicians, and the Japanese nuclear industry. The prosecutor’s office will decide by July whether to indict Takenouchi. If they go ahead with the case, she may be held without bail until her trial, as is often the case in Japan, without a right to see a lawyer or have one present during questioning. Police told VICE News they would not comment on the case "due to privacy matters." The investigation of Takenouchi is an unusual but not unique example of an ever-increasing crackdown on freedom of the press in Japan. Earlier this year, Reporters Without Borders issued a statement condemning "the censorship and self-censorship that continues to prevail in discussion of nuclear energy in Japan three years after the disaster… [and] the treatment of independent journalists and bloggers who are critical of the government and the nuclear energy lobby." In Reporters Without Borders' press freedom rankings for 2013, Japan fell to a new low of 59th place, due in part to the Special Secrets Act passed in the middle of the night in December, and “the ban imposed by the authorities on independent coverage of any topic related directly or indirectly to the accident at the Fukushima No. 1 nuclear power plant.” Amid these discouraging trends, Takenouchi waits to learn her fate. “We are still considering whether to prosecute or not," a prosecutor's office spokesperson said. "We’re not aware of past cases in which tweets were found to be the basis for criminal contempt, but the law is the law." SUBHEAD:Ex-mayor Fukushima Prefecture lashes back at criticism over depiction of nosebleeds in manga caused by Fukushima plant. 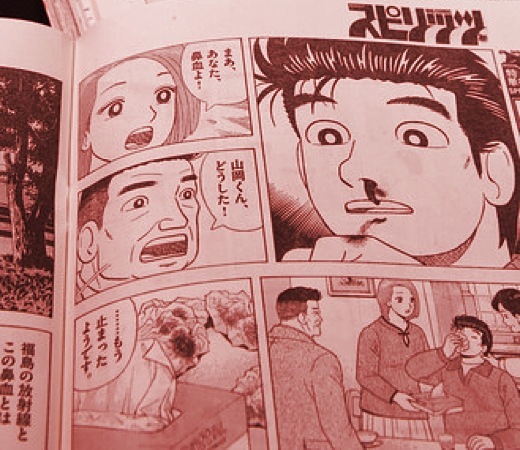 Image above: Popular manga comic depicting nosebleeds in Fukushima Prefecture. From original article. The former mayor of a Fukushima Prefecture town near the crippled Fukushima No. 1 Nuclear Power Plant says he has no intention of retracting comments from a manga series in which he appears as himself, claiming he has been experiencing nosebleeds. Katsutaka Idogawa, 67, former mayor of the Fukushima Prefecture town of Futaba, is featured in the popular comic series "Oishinbo." The main character is a newspaper reporter who goes to cover the crippled Fukushima plant and later experiences nosebleeds when he comes back to Tokyo. Idogawa says his nose bleeds regularly and that there are many others in Fukushima who have developed similar symptoms. After receiving inquiries about the depiction in the story, publisher Shogakukan released a statement saying it decided to publish the issue respecting the author's expression, which was based on thorough research. Idogawa told a news conference on May 9 in Tokyo that he has heard many stories about local residents experiencing nosebleeds. He says his nose bleeds every day, especially in the mornings. "There is no way I would retract my comments in the manga," Idogawa said. Responding to Environment Minister Nobuteru Ishihara's criticism of the depiction, Idogawa commented, "The minister has no business with my physical condition." Manga author Tetsu Kariya wrote in his blog, "I am responsible for everything (in the story)." He asked readers not to complain to the publisher. The editorial department of Big Comic Spirits, the weekly magazine that carries the manga series, posted a comment on its website that the story was not intended to judge the cause of nosebleeds or spread harmful rumors about areas near the nuclear plant.